As we all know, today is the 50th Anniversary of the March on Washington. Somehow, I don’t know how this can relate to me, as I’m not African-American and my friend Maddy is only half African-American. Plus, I learned that according to a family legend, my grandmother sent Dr. King a scathing letter condemning his efforts to fight for equality for all Americans and saying that African-Americans need to hate the white man for enslaving them and depriving them of their rights. I wonder if she really was serious; no one really had the guts to ask her about the letter. 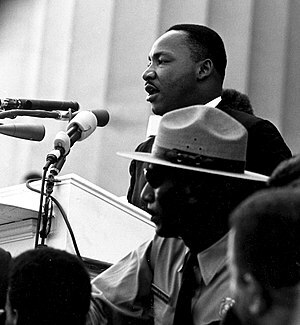 But instead of anger and hate, Dr. King chose to take a different path, the path of peace and love. I hate to break it to you, grandma, but solving problems with peace does more than just hating a certain group of people because of some mistake that happened years ago. Hate does nothing but destroy people, and do you really want to destroy people just because they’re White or African-American or any other ethnicity?